The statement above is true, in case you are wondering. Case-maker Urban Armor Gear organized this epic drop test from a height of approximately 101,000 feet. All these were done to check whether its case can protect the phone. Surprisingly, it did. 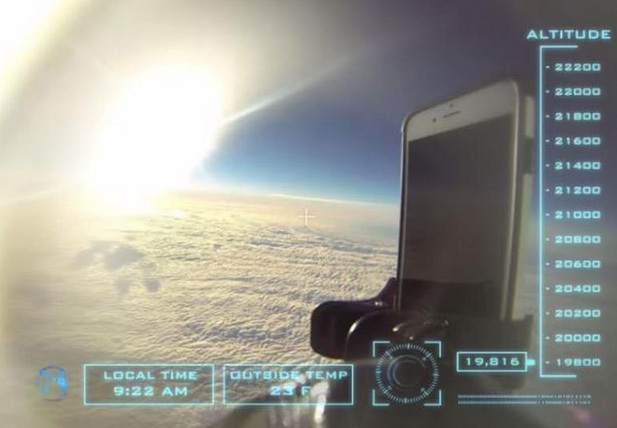 Initially the device wearing UAG’s rugged case was lifted up to the stratosphere with the help of a weather balloon; two GoPro cameras were attached as well. As it reached the stratosphere (approximately 101,345 feet), the balloon popped and down came the silver iPhone 6. Although a parachute was attached to the device but the landing was still a bit rough but the iPhone 6 wearing UAG’s special jacket survived the drop ‘Like A Boss’. Throughout its journey from the edge of space down to earth the iPhone 6 had to bear temperatures of approximately -70 degree Fahrenheit, 70 miles per hour of wind and 150 rpm spins, according to Cnet. It was also reported that the iPhone’s battery died up at -79 degrees Fahrenheit but once it was back down, the device seemed fully functional after recharging.